The Vitamix CIA™ Professional Series Blender offers a perfect blend of professional-quality blending equipment and professional chef inspiration. Create the perfect organic banana smoothie or cook up a warm delicious apple butternut squash soup with the superior Vitamix CIA™ Professional Series Blender. No need for a cluttered kitchen counter filled with coffee grinders, food processors or small blending devices. 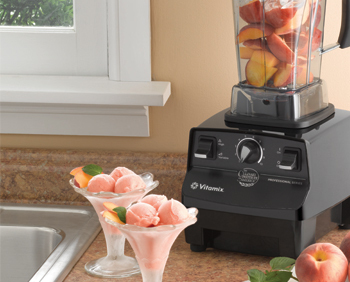 This Vitamix blender, endorsed by the Culinary Institute of America has it all. The Vitamix Professional Series Blender is a juicer, blender, food processor, ice-cream maker, coffee grinder, and other kitchen tools all wrapped into one amazing appliance.